Add Transcript requests in seconds and go back to work. 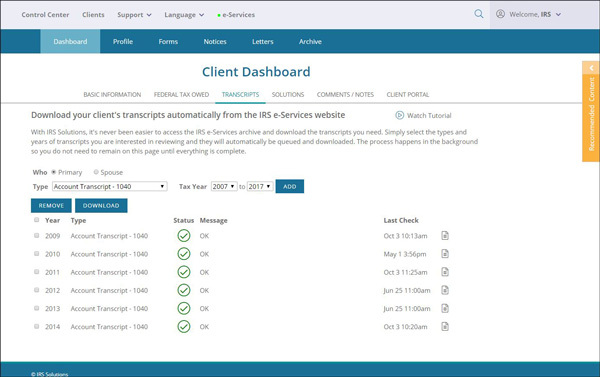 IRS Solutions e-service transcript tool requests, downloads and analyzes IRS transcripts in minutes. IRS Solutions streamlines the transcript delivery process to save you time. Whether you need Account Transcripts, Wage & Income Transcripts, or Tax Return Transcripts we have you covered. Download multiple transcripts in minutes. Start previewing them as they come in so you don’t have to wait. 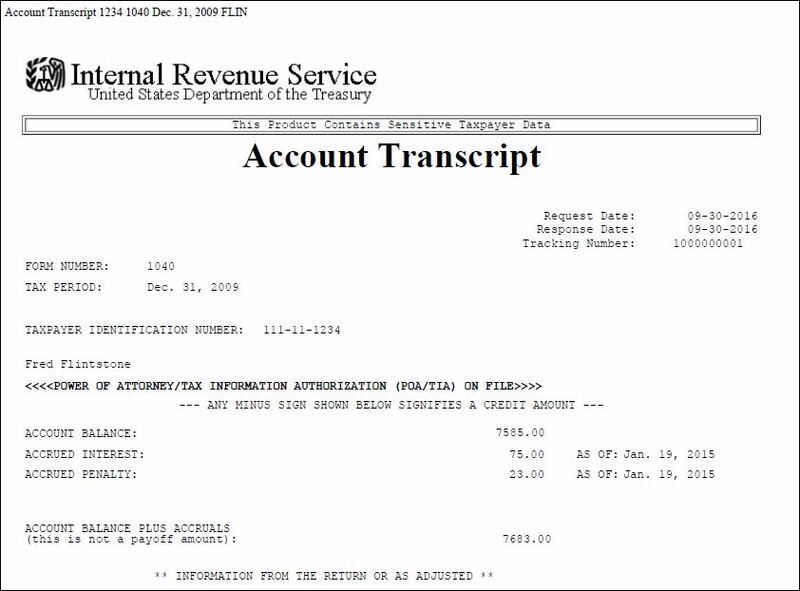 We got tired of painstakingly logging in to request, download, review, print and analyze IRS account transcripts. So we created this tool to help tax pros save time and get quick answers for their clients. 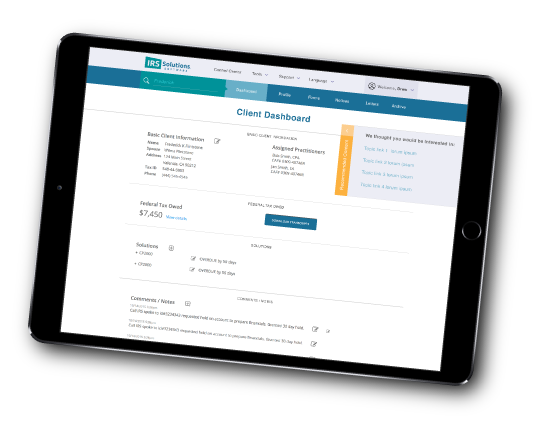 Quickly view the clients tax situation so you can get a snapshot of where they stand. 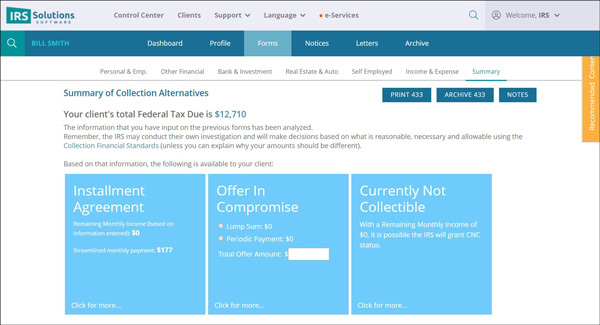 IRS Solutions transcript analyzer gathers the details to give you what you need to navigate the collection process. 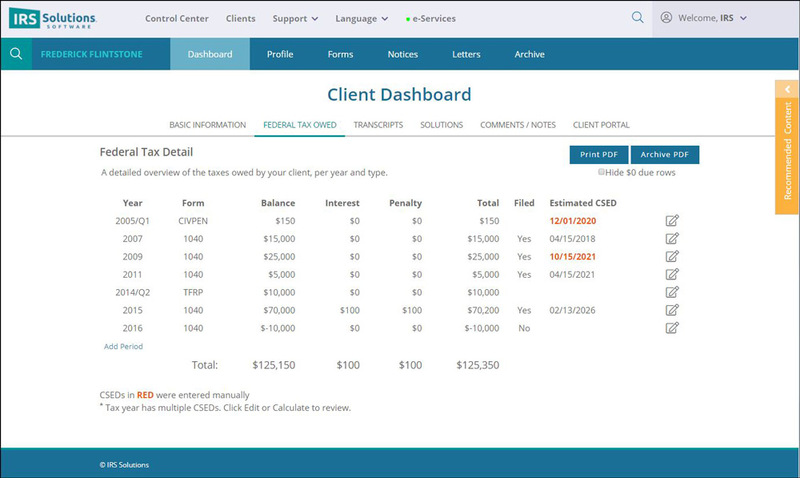 Get the birds eye view of where your clients stands in minutes. No more need to download each transcript and input into another program or spreadsheet. Start Using the IRS Transcript Analyzer Today at No Additional Cost! It’s Already Included with Your IRS Software Membership! IRS Solutions built the transcript analyzer to help save time reviewing each transcript. We understand the need to analyze the clients situation and get quick tips and suggestions of likely outcomes. Even though it is up to the tax pro to review their clients situation IRS Solutions tools make it easier and faster than doing it all on your own.